When Do QuakeCon 2018 Tickets Go On Sale? QuakeCon 2018 is happening soon, and we know when and where fans can register for general admission, tournaments, and more. Readers here on Shacknews will need no introduction to QuakeCon — it's the be-all, end-all event for all things Quake and id Software, and the convention is set to kick off very soon. While entry will be free for general admission, players who want to bring their own computers (BYOC) and jump in on all the action will need to move quickly in order to buy their tickets and secure their spot during the event. With that in mind, we've got the skinny on everything potential attendees need to know concerning when tickets go on sale, where to purchase tickets, how the new ticket queue system works, and what sort of ticket and upgrade packages are available. When Will QuakeCon 2018 Tickets Go On Sale? Tickets to this year's QuakeCon 2018 convention will go on sale starting Friday, June 29th, with sales opening at 7:30 p.m. Central time — that's 5:30 p.m. PDT and 8:30 p.m. EDT. The event's organizers have made efforts to ensure that purchasing tickets is easier than ever before, going so far as to provide special options for players who want to purchase tickets for groups up to 10 fans strong as well as new systems for seat registration and swag pack purchases. For added convenience, the crew have put together a handy chart detailing ticket prices and the benefits and bonuses of each ticket tier, the likes of which can be seen in the image below. Aside from this information, buyers will note that all purchasers must be present on-site at the Gaylord Texan in Dallas, Texas between the event dates of Thursday, August 9 through Sunday, August 12. They'll also need to present proof of purchase in order to receive their swag bags, the likes of which cannot be returned, exchanged, or refunded. Where Can QuakeCon 2018 Tickets Be Purchased? QuakeCon 2018 tickets can purchased through the QuakeCon 2018 page over on Showclix. Users who managed to snag a presale code can pick up their tickets right this moment; otherwise, buyers will have to wait until ticket sales open up at 5:30 p.m. Central on June 29. How Does The QuakeCon Ticket Purchase Queue System Work? Potential QuakeCon 2018 attendees should note that there is a queue system in effect for ticket sales. Customers visiting the ticket sales page will want to have cookies enabled on their browsers, as those cookies will ensure that they won't lose their place in the ticket queue if they accidentally close their browser window or otherwise suffer any kind of computer malfunction. Once loaded into the queue, buyers will be directed to the checkout page once their turn arrives. Be sure not to refresh often or attempt to circumvent the queue either — while the crew has stated that refreshing the page shouldn't affect their place in the line, according to the official QuakeCon website, they've specified that any "activity that is deemed malicious or excessive could result in [buyers] being banned from our servers." How Many QuakeCon 2018 Tickets Can One Person Purchase? How Many Tickets Are Available? QuakeCon is more fun with friends, and the event organizers know this, which is why they're allowing up to ten tickets to be purchased with each transaction, so long as they're for general admission or for a BYOC seat. 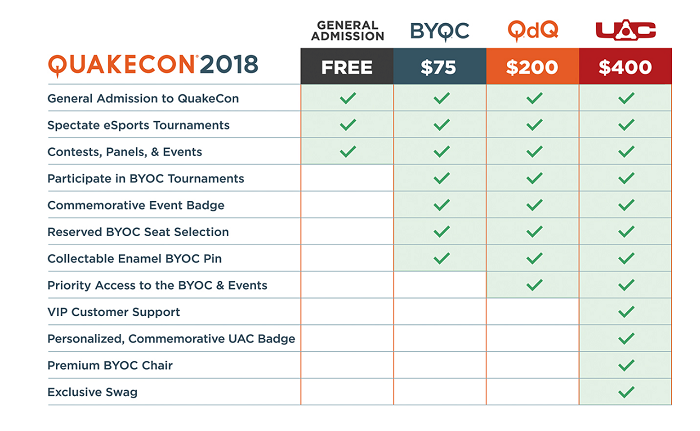 Beyond that, buyers can also purchase up to ten QuakeCon Done Quick seat upgrades, up to three Swag Pack packages, and just one UAC VIP seat upgrade package. As for the event itself, the QuakeCon website states that over 4,500 BYOC seats will be available for reservation, which is a number that exceeds twice the available number for the QuakeCon 2017 convention. With that said, the overall number of QuakeCon 2018 seats will be limited: there will only be a set number of UAC VIP seat upgrade packages, 250 QuakeCon Done Quick seat upgrade packages, and just 500 Swag Pack merchandise packages being offered. With that in mind, buyers would be wise to secure their place in the ticket queue early to ensure they get the seats and the packages they most desire.